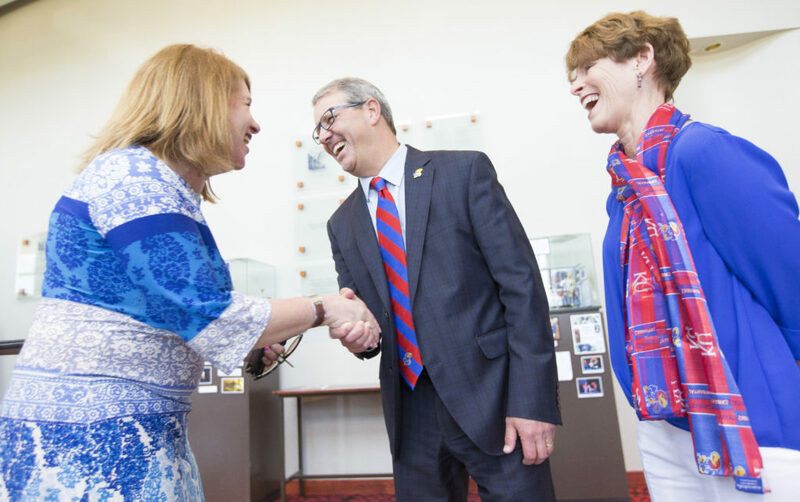 Dr. Doug Girod, executive vice chancellor of the KU Medical Center is congratulated by Lisa Pinamonti Kress, director of admission at KU with after being announced as the 18th chancellor of the University of Kansas on Thursday, May 25, 2017 at the Lied Center. At right is Girod's wife, Susan Girod. A medical doctor and the top administrator at the University of Kansas Medical Center will be the next chancellor of KU. Douglas Girod has been executive vice chancellor of the KU Medical Center in Kansas City, Kan., since 2013. He first joined the KU Medical Center faculty in 1994 and became chair of the Department of Otolaryngology-Head and Neck Surgery in 2002. The Kansas Board of Regents announced its selection and formally voted to hire Girod as KU’s 18th chancellor Thursday during a special meeting called on KU’s Lawrence campus. The board has yet to approve a salary. Girod will begin the new job on July 1. Dr. Doug Girod, executive vice chancellor of the KU Medical Center, speaks with media members after being named as the 18th chancellor of the University of Kansas on Thursday, May 25, 2017 at the Lied Center. Girod said recruitment, retention and graduation rates would be one key focus. Research will be another major priority, Girod said. 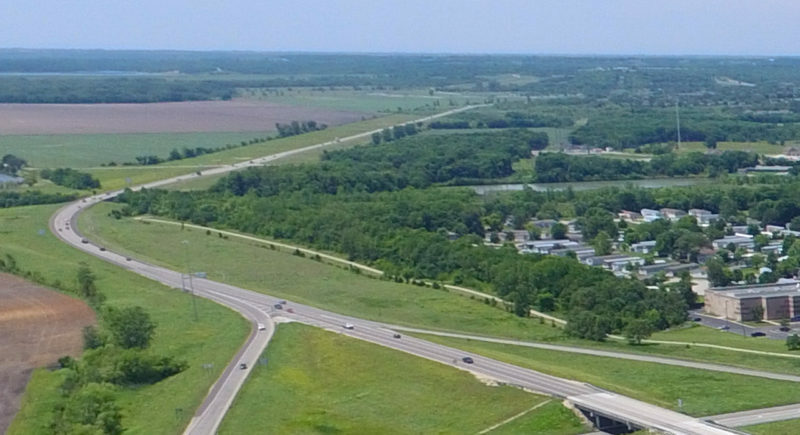 Not only is it critical for maintaining KU’s status in the prestigious Association of American Universities, it also helps economic development in the state and region. 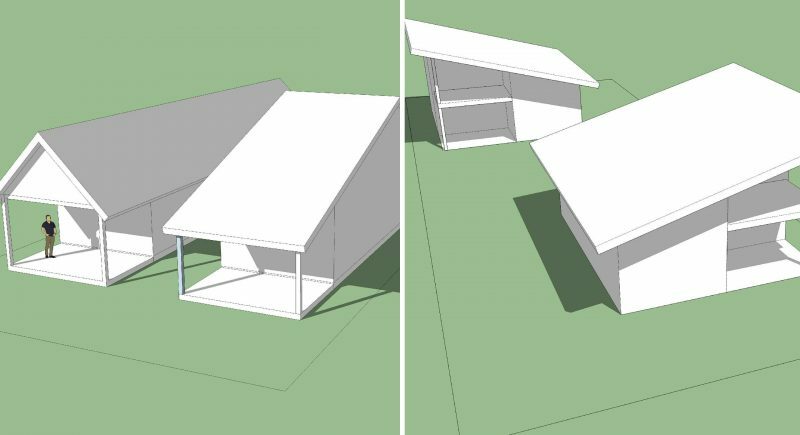 Girod has been involved with medical center efforts to expand KU’s reach across Kansas, including to rural populations. KU Health System has increased partnerships with other hospitals and practices across the state, too. 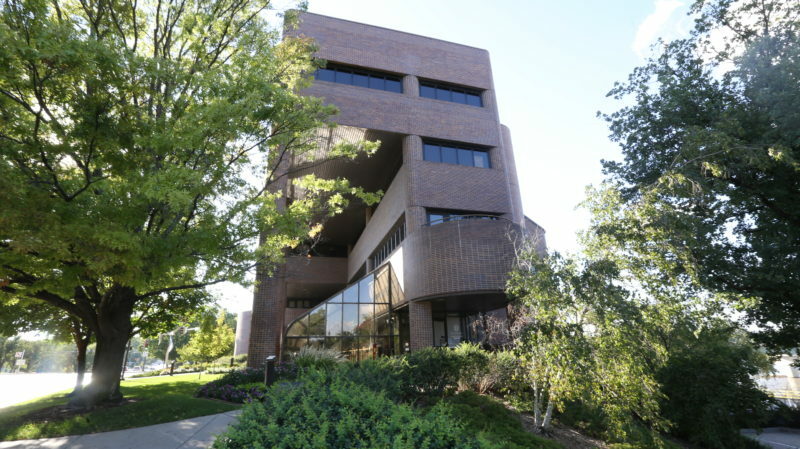 Girod’s medical background also connects with the KU Cancer Center, which currently is seeking designation as a National Cancer Institute Comprehensive Cancer Center. Girod is an otolaryngology — or ear, nose and throat — surgeon, specializing in treatment of and reconstructive surgery following head and neck cancer. His leadership is credited with advancing KU Hospital’s national rankings in the field. Prior to joining KU, he was vice chairman and research director in the department of otolaryngology at the Naval Medical Center in Oakland, Calif., according to his KU profile. Girod was in the U.S. Navy Reserve, from 1982 until being honorably discharged in 1997, reaching the rank of Lieutenant Commander and later earning the Meritorious Service Medal. In the Kansas City area, he’s worked on numerous health and economic development initiatives. He’s also led and participated in medical missions to developing countries in Africa and Latin America. Girod earned his bachelor’s degree in chemistry at University of California at Davis, his medical degree at University of California at San Francisco, and completed a residency and NIH research fellowship at the University of Washington in Seattle. Moving to the chancellor’s residence on the Lawrence campus and overseeing the entire university — including KU’s roughly 19,000 undergrads — will be a culture shift. Girod said he looks forward to the “intensity” and “enthusiasm” on campus. “It’s a different vibe, to be sure, and a very exciting one that we’re looking forward to immersing ourselves in,” he said. Girod, 59, and his wife, Susan, currently live in Mission Hills. Girod is a native of Salem, Ore. He has three adult children, he said. 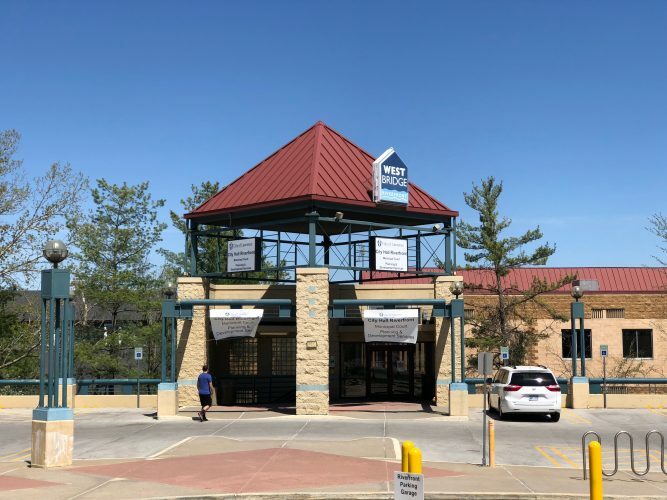 The KU chancellor, the university’s chief executive officer, oversees the university’s main campus in Lawrence, the KU Edwards Campus in Overland Park and the KU Medical Center campus in Kansas City, as well as smaller School of Medicine campuses in Wichita and Salina. 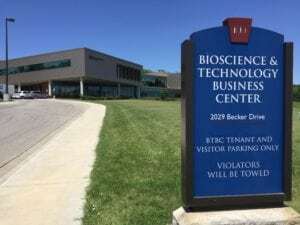 The chancellor also oversees KU research and educational centers in Hays, Parsons, Pittsburg and Topeka plus the Kansas Law Enforcement Training Center in Yoder. 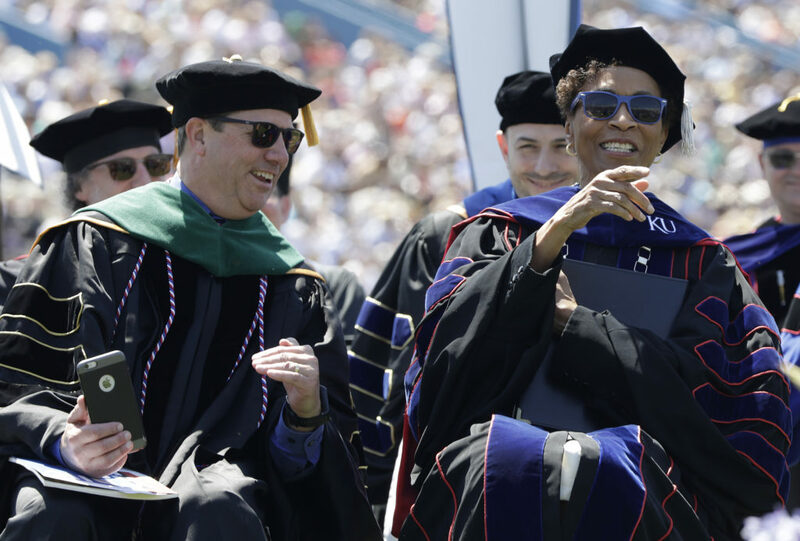 Douglas A. Girod, M.D., executive vice chancellor of the University of Kansas Medical Center, left, and KU Chancellor Bernadette Gray-Little react to chants from the graduates asking Gray-Little to stay one more year. 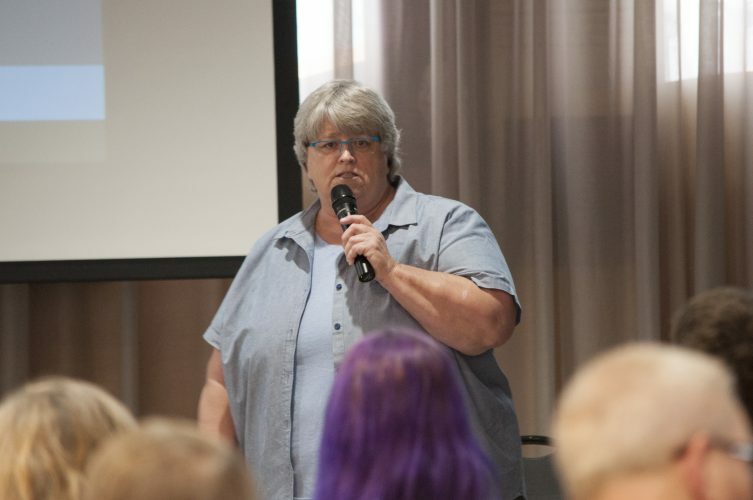 Gray-Little has announced she is stepping down this summer. The two participated in the KU commencement ceremonies Sunday, May 14, 2017 on the KU campus. A KU insider, Girod has the advantage of having worked alongside outgoing chancellor Bernadette Gray-Little. She said, in a news release from the Board of Regents, that Girod will bring a “wealth of experience” to the role. Gray-Little, 72, announced in September that she would step down this summer. Gray-Little, formerly provost and executive vice chancellor at the University of North Carolina at Chapel Hill, became KU’s 17th chancellor in 2009. The Board of Regents launched a closed search process, meaning names of all candidates and finalists are kept confidential, in late fall. The consulting firm of R. William Funk & Associates was hired to help recruit candidates. A 25-member chancellor search committee, chaired by KU alumni and former Kroger CEO David Dillon, vetted candidates and presented finalists to the board. The board interviewed finalists earlier this week. 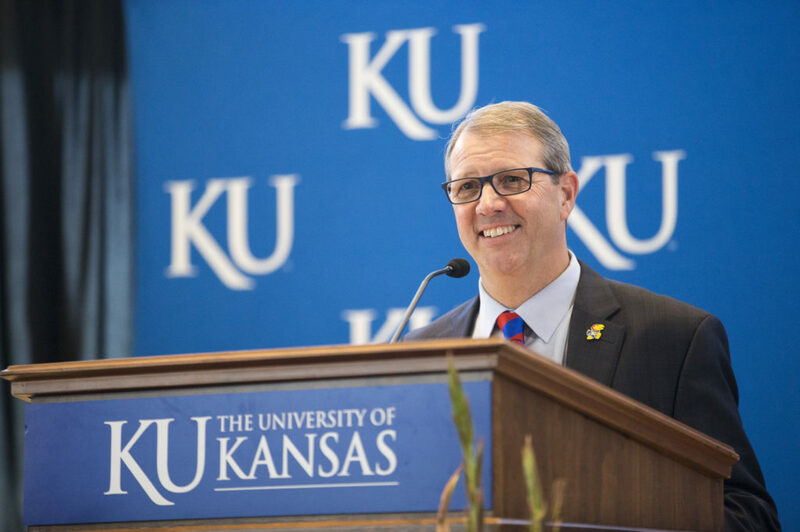 Douglas Girod (pronounced jih-ROD) will become the 18th KU chancellor in July. Family: Wife, Susan Girod. Three grown children. Home: Currently Mission Hills. Native of Salem, Ore. Currently: Executive vice chancellor of KU Medical Center, since 2013. Responsibilities: Oversees KU schools of medicine, nursing and health professions — home to more than 3,300 students, 2,100 faculty and 4,000 staff; research funding of nearly $100 million; campuses in Kansas City, Wichita and Salina; and outreach activities in every Kansas county as well as western Missouri. Medical specialty: Otolaryngology (ear, nose and throat) surgeon, specializing in treatment of and reconstructive surgery following head and neck cancer. Specific areas of focus include tumors of the mouth, thyroid and parathyroid glands. Past positions at KU: Joined KU Medical Center faculty in 1994, became chair of the Department of Otolaryngology-Head and Neck Surgery in 2002. Also served as senior associate dean for clinical affairs for the department, and interim executive dean for the KU School of Medicine. Previous employment: Vice chairman and research director in the department of otolaryngology at the Naval Medical Center in Oakland, Calif.
Military service: U.S. Navy Reserve, from 1982 until being honorably discharged in 1997. Girod reached the rank of Lieutenant Commander and later earned the Meritorious Service Medal. Education: Bachelor’s degree in chemistry, University of California at Davis. Medical degree, University of California at San Francisco. Residency and NIH research fellowship, University of Washington in Seattle. Scholarship: Co-edited the textbook “Oral Cavity Reconstruction,” authored 14 book chapters and published more than 70 articles in scholarly journals. Served on editorial boards for several scholarly publications. Professional involvement and honors: Past president of the American Head and Neck Society and vice president of the Triological Society. Among numerous honors, Girod received the 2006 Student Voice Award for Teaching on a Surgical Rotation, bestowed by KU School of Medicine students. Community involvement: Medical missions to Uganda, Guatemala, Mali, the Philippines and Mexico. Kansas City Kansas Chamber of Commerce board and Mayor’s Healthy Community Initiative. MRI Global and Kansas Medical Society boards of trustees. Past co-chair, current steering committee member of KC Rising regional economic development effort.